Hollywood's making 'Just Dance' and DDR movies, but why? Somewhere deep in the bowels of Skull Mountain, where Hollywood‘s evil studio bosses come up with all of the movies and TV shows Tinsel-town will produce, things are amiss. The well, as they say, has run dry. Otherwise there wouldn’t be two upcoming films adapted from dancing-based video games. Screen Gems, the company responsible for one of the greatest motion picture thrill-rides of all time, “Anacondas: The Hunt for the Blood Orchid,” recently secured the film rights to the 10-year-old Just Dance franchise. It’s already put together a production team to work with the game’s publisher, Ubisoft. In case you’re not one of the 120 million people who play the Just Dance games, there’s something crucial we should make clear here: the game doesn’t have a story. There aren’t any characters, per-say, and there’s no plot – players just dance. Get it? It seems weird to develop a movie based on a video game without a narrative. It’s obvious this is a cash-in on both company’s parts. Especially considering this acquisition comes on the heels of another dance-based video game without a plot getting a movie that’s now in pre-production, Dance Dance Revolution. Folks, there’s an actual rush on dancing game film rights. 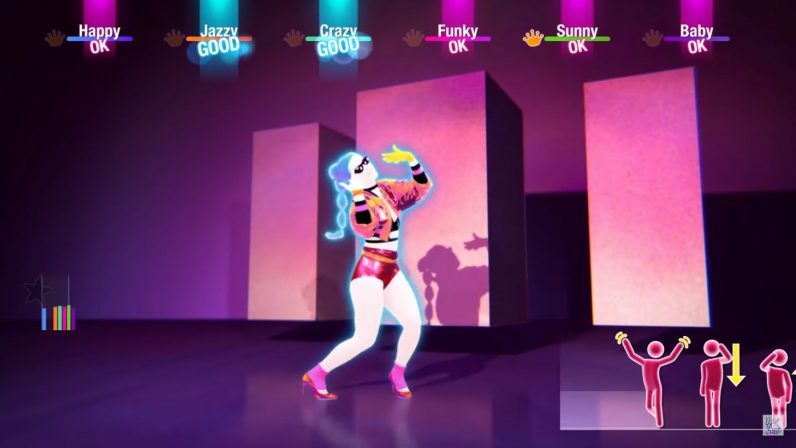 In competitive bidding, Screen Gems has acquired motion picture rights to Just Dance, the wildly popular Ubisoft video game. Screen Gems will develop a film based on a franchise that is the bestselling music video game of all time, with 120 million players worldwide in all age ranges. Multiple studios competed for the rights deal. So there you have it: it’s 2019 and there are two movies in the works based on dancing video games that have neither characters nor plots. Seems silly, but we’re not going to dismiss the idea that both could end up being epic masterpieces. They probably won’t, but it’s fun to pretend. Let’s start with Dance Dance Revolution. You’ve seen this one in arcades — it’s the machine where a couple of people jump around to some pretty decent tunes. Keanu Reeves is a middle-aged cop who finds himself locked in an arcade when terrorists take over the establishment in protest of Blizzard’s latest announcement. It doesn’t matter that these two things aren’t related. He and Sandra Bullock must play DDR, and maintain a dance-rating of “killer,” or the entire building will blow up killing everyone in the mall. Maybe that wouldn’t be a good movie, but it’s almost surely better than whatever “we gotta save Dance-land!” theme the writers in Hollywood will come up with. If we got Uwe Boll to direct it seriously it’d sell itself as satire. We’ll try a bit harder with Just Dance. This one’s a bit different because it tracks your whole body instead of just your steps and stomps. We open on an explosion. Vin Diesel (he’s in it too) and The Rock slingshot a black 1964 Chevy Nova off of a ramp and into the Ubisoft offices, taking out the company’s mainframes. They’re subsequently arrested for a number of felonies and sentenced to community service. What kind of service you might ask? Why, paying Ubisoft back by recreating the moves in every video game the company lost (because video games are all made by using motion capture and that’s it) starting with… you guessed it: Just Dance. We’ll stop there because we don’t want the Writer’s Guild coming after us for infringing on their turf. Anyway, the rest is just montages of Vin Diesel and The Rock slowly becoming the greatest dancers of all time. Fade to black. Again, it’s possible both of these movies could end up being stellar. Who knows. But, with so many amazing video game IPs full of incredible stories and fantastic characters just waiting for the big screen treatment, it feels like a wasted opportunity.